Visit our restaurant, taste our dishes which not only have the local, palóc flavour but are also prepared according to the modern healthy trends and meet the wishes of those who like the international and national delicacies. We can serve 120 guests at the same time, in one room on a high quality, but in the adjacent extra room that opens to the lobby on the ground floor for additional seats provides. If the weather is good, the restaurant’s terrace is an excellent place for a pleasant meal. 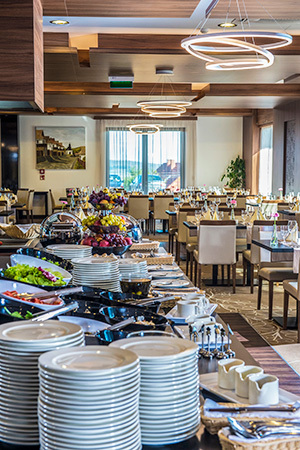 Mikszáth Restaurant is the perfect choice for events, business or family dinners, weddings, balls or banquets. The interior, quality and atmosphere of our restaurant provide our guests with really exclusive experiences. You find several dozen special dishes on our menu, and with our half-pension service we serve the whirlwind of flavours in a buffet-style breakfast and dinner. We feel that it is our obligation being in this branch and running a restaurant in Hollókő, the village known as the crown-jewel of Nógrád county, that we follow the local Palóc traditions and introduce these to our guests. So naturally, you can find the most known palóc dish on our menu, Palóc gulash (according to the original recipe). This dish was prepared by János Gundel, for the “greatest palóc person,” Kálmán Mikszáth. In its taste it indeed resembles the sour potato- or bean soup which is so popular among the palóc people, but it has so many more flavours and one can find really everything in it that grows in palóc-county. So based on this, it could actually be a real palóc dish. To the palóc dishes, we recommend the award-winning pálinka range of Öregetesi Pálnka distillery, which you can also taste in the hotel’s restaurant.